The Wang Lab in the Department of Radiology at the UC Davis Medical Center researches computational molecular imaging methods and clinical translation. An emphasis is put on dynamic positron emission tomography (PET). 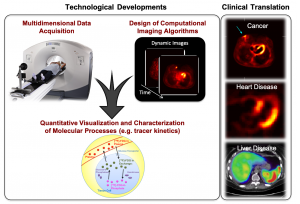 By developing advanced algorithms to exploit the value of multidimensional data we collect, we can make PET molecular imaging better, cheaper, safer and more informative in reducing the burden of disease.